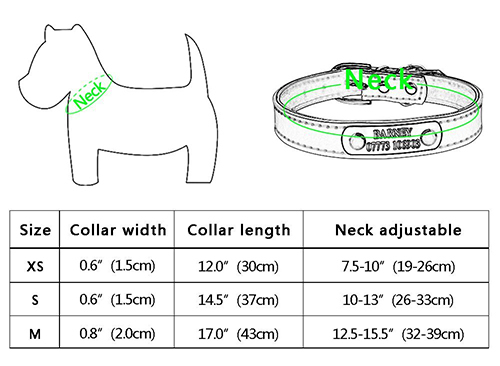 This cute Soft and Sturdy padded leather collar is designed with strong material and high quality stitching. Your pets name can be engraved on a silver metal plate. Select from XS, Small or Medium. Please follow size chart below for correct sizing. NOTICE: This product is custom made and will ship to you within 10-15 business days. Great collar for the price! Just as pictured! The size small was a perfect fit for our Boston Terrier with room to grow! Would definitely buy again! I love it! Has his name, and my phone number great collar for such a good price. like the subtle print of the engraving because I don't want my phone number too bold on the nameplate. Availability: Exclusively Online. Shipping Estimate: Ships within 10-15 Business Days.